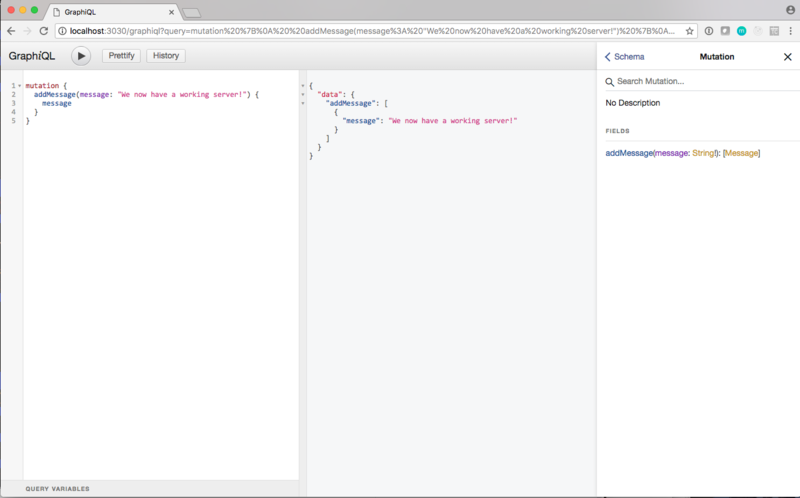 In this post, we will not go through GraphQL from the ground up. My assumption is that you are here to learn how to implement real-time through the use of the graphql-subscription package and that you already have a basic understanding of GraphQL types, queries and mutations. We are going to use Apollo for this tutorial. Apollo was made by the same guys who made Meteor and is a bit opinionated but is also arguably one of the most popular full-featured GraphQL libraries around. We will also use React and create-react-app to bootstrap our client application on the second part of this tutorial. That being said, some knowledge of higher order components is also assumed (in Part 2). That's it for the server setup! Let's proceed on fleshing out the subscription implementation. If there are no errors and you can see the definition above, then we are ready to make this work by, you guessed it, implementing the resolver function for newMessageAdded. 2. Every time our `addMessage` mutation is queried, we will publish a message to `newMessageAdded`, using the new `message` as the payload. We just implemented our first subscription query! Every time our server publishes a message to newMessageAdded, clients that are subscribed will get the published payload. As an aside, the helper function withFilter is not actually required nor used in our example here (just subscribe: () => pubsub.asyncIterator('newMessageAdded') will do for this tutorial), but I figured that this will be helpful if you want to try something useful with this whole pubsub ordeal, like say, a classic chat app. The second function that you pass as an argument to withFilter will allow you to filter out the subscribers who will receive the message. This is done by using the field in the actual payload that is about to get published (params) and the GraphQL query variables from the subscription (variables). All you need to do is to return a truthy value if you want it sent to this particular subscriber. It will look roughly similar to this: return params.receiverId === variables.userId. Of course, that is assuming that a query variable called userId was sent along with the subscription. Since we do not have an application that will subscribe to our server yet, why don't we try this out with Graphiql? If you can see the same message above, great! Everything is working awesome. But if we do not publish anything anywhere on our server, nothing will happen. Yep, we are about to do just that. As soon as you send a addMessage mutation on the second browser, the first browser receives the message, and displays it instantly! How cool is that? Let's wrap up what we learned in this short tutorial. 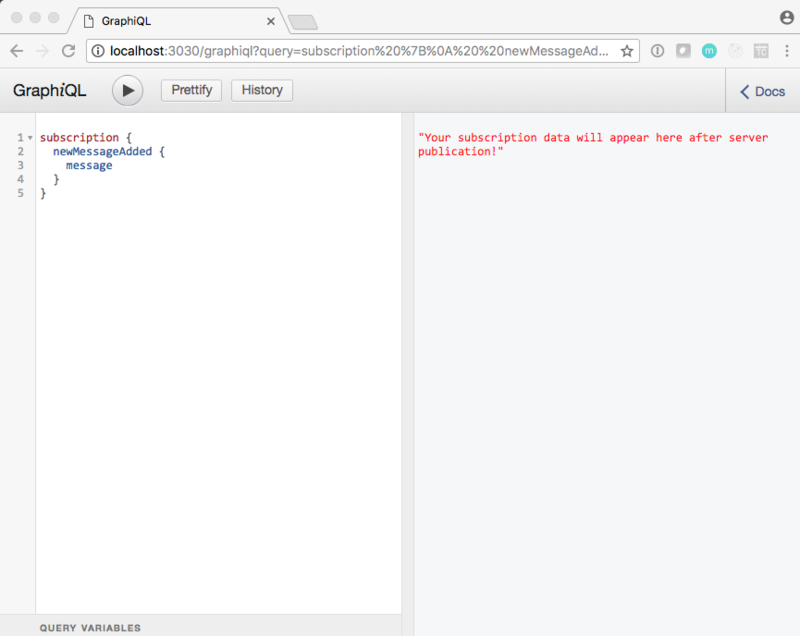 In this tutorial, we learned how to set up subscriptions and publish message across subscribers using graphql-subscriptions. On the next part of this tutorial, we will use apollo-client with react-apollo to see how this will work with a real application as the subscriber. If you encountered any errors or have any questions about this, let me know in the comments section below!